It's amazing how much can happen in two years. A helpless newborn baby can turn into a determined, highly mobile and stroppy toddler, and a vast-seeming industrial unit with a shiny new brewkit looking very small and slightly lost at the back can turn into something so chock-full of stuff that it needs almost triple the floorspace. Image used with permission of totalales.co.uk"
So when we turned up for an open-Saturday that was also both a party to mark Fourpure's second anniversary – not of its set-up, but of its first brew – and a launch for two new beers, the available space for guests was a mite crowded. It was also raining outside, which on the one hand forced everyone indoors but on the other presumably persuaded some people to stay at home and avoid adding to the crush. Fortunately, everyone was in a good mood, even the toddler. And there's no passing traffic because Fourpure's at the back of an industrial estate where everything else is shut on at the weekend, so our only worries when she escaped outside were the puddles. The two new beers were Southern Latitude, a fruity and bitter 4.7% 'South Pacific pale ale' with Australian hops, and Northern Latitude, a gorgeous Scandinavian-inspired 6.4% Rye IPA, dry-bitter and warming, full of toasted toffee and pine resin notes – Fourpure has quite a decent export business to Scandinavia now, incidentally. Among the others on the bar that were new to me were Morning Star, which was an excellent full-bodied, roasty and chocolatey 7.1% Imperial Porter (historically that'd be a Stout, but never mind! ), Red Rye Session IPA which was 4% and cloudy, but had lovely pine aromas and a crisp dry-sweet body, and a 5.2% wheat ale using the Middle Eastern spice Sumac. This Sumac Wheat was an unattractive murky tan colour with equally unappealing sour yeasty aromas, but thankfully it tasted much better that it looked and smelled, balancing a dry earthy bitterness with light fruity sweetness. 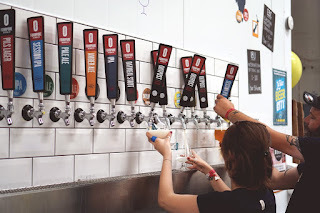 As well as my first sight of the reorganised brewery bar, which now has 16 taps, giving them 10 for regulars and six for experimental brews, the visit was my first chance to see one of those experimental brews in production. Alongside the main 35hl (20 barrels, stretched a little) brewkit, Fourpure has a 1hl (100litre) pilot kit, which by the look of it is made from steel kegs, and this is where those extra six beers come from. He also ran through the expansion plans. Fourpure's taking over another similarly-sized industrial unit nearby for processing and packaging, so the bright tanks and canning line will move there. A large railway arch will also be taken on, as both a distribution centre and a cold-store for lagering. More interesting for aficionados is that a wall of wooden barrels will fill the brewery space freed up by moving out the packaging stores. Barrel-ageing of beer is immensely fashionable and is also key to producing certain styles such as Lambics and Bretted beers, but as JT noted, it is not a short-term thing – they expect it will take four years to work out which are the best barrels and for those to develop the right microflora inside. So what has enabled Fourpure to grow so fast? One thing seems to have been having investors with deep enough pockets. 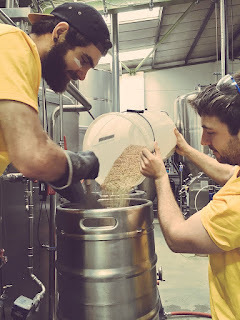 That allowed them to go straight for a decent-sized brewkit, then as sales ramped up all they needed to add was more fermenters and more packaging capacity. JT noted that most of the tanks are now 70hl and take two brews to fill, while the biggest – used for beers that need a decent lagering time – takes a stonking four brews. I suspect another thing was the way they focused first on getting a few well-made beers in volume into the sort of venues that wanted “craft” but couldn't handle cask ale, such as bars and restaurants, then swiftly pivoted to a broader range of short-run beers once the market opened up. The ability to can without having to do 100,000 at a time – Fourpure was the very first UK brewery to buy its own microcanning line – also widened the distribution opportunities. 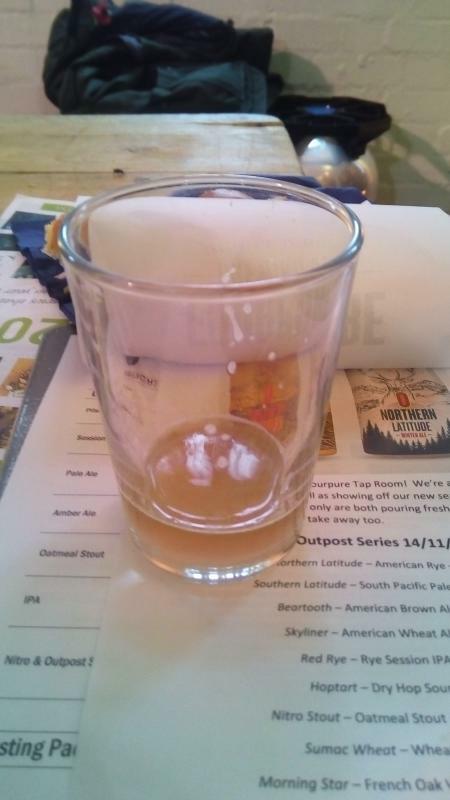 Two years ago I was predicting that Fourpure would become a straightforward supplier of crafty beer styles to a local mainstream market, as the craft-keg equivalent of a old-fashioned regional cask brewer perhaps. It has certainly achieved that – the other day I spotted several of its taps in an outdoor kiosk by London's South Bank Centre, for example. Yet it has also evolved alongside the craft beer market, becoming something rather more innovative – just like some of those regionals have, I suppose. It's similar to the solid yet adaptive business plans that seem to have served other start-ups well, for example Windsor & Eton and Truman's. What shall we call it – surfing the zeitgeist?